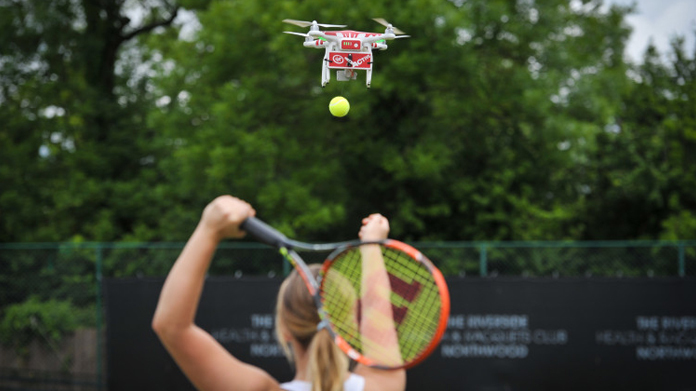 In time for Wimbledon and in a bid to promote Virgin Active’s Racquets clubs across the country, we launched (well, invented and then launched), Drone-ovic. Who knows, maybe Sam Querry used it to crush the world number one? Anyway, if he did, he’d have known that it was invented to enable Virgin Active members to practice their smashes just like the man himself. Dropping a ball from many metres up, it recreates perfectly the sensation of playing against the man himself – while at the same time training them to smash like a grand slam pro. A cheeky video meant featuring Drone-ovic itself found its way across the media with an agency highlight being a spot on mashable – a sure sign that your story has captured attention (the piece was shared over 800 times at the point of writing. Then there was the Daily Mirror, there was the Independent, The Irish Examiner, Yahoo Video, Aol., SBTV, LiveSmart, as well as this beauty on Sports Illustrated, The Memo, BT.com, Engadget, PSFK, Tom’s Guide, Sport Techie, Lavous in Vietnam, some sites in Japan, the Middle East and a host of others.